If you are looking for an additional source of amino acids, minerals, vitamins, enzymes, and natural barley grass juice! 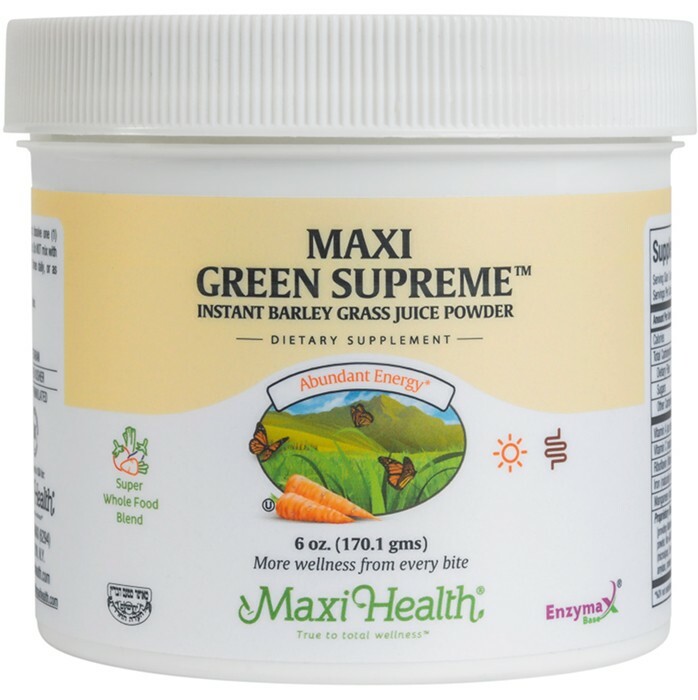 Without the use of stimulants, Maxi Green Supreme™ supports natural energy levels because it contains many important nutrients. The barely grass used in Maxi Green Supreme is planted in the fall and grown through the winter. It is nutritionally superior because these grasses grow slowly and develop naturally in an ideal climate. Barley grace juice supports the ability of the body to deodorize itself naturally. It is a superior product that contains phytonutrients and phytochemicals to support energy levels, and provide exceptional nutrition. Spirulina is a food grade algae. It’s a whole food rich in minerals, vitamins, proteins, essential amino acids, and essential fatty acids, including iron, and beta-carotene. Maxi Health Research® uses only Earthrise® Spirulina known for its high quality and low heavy metal content. Lecithin is a B vitamin. It's high in choline and inositol. Try Maxi Green Supreme, your healthy energy drink. As a food supplement, dissolve one (1) level teaspoon in cold water or juice. (Do NOT mix with hot liquids). Recommended 2 to 3 times daily, or as directed. This product contains no animal products, wheat, salt, milk, yeast, artificial preservatives, flavors or colorings. This is a gr8 product! I took 2 teaspoonful mixed with liquids and the next day I felt more energetic.